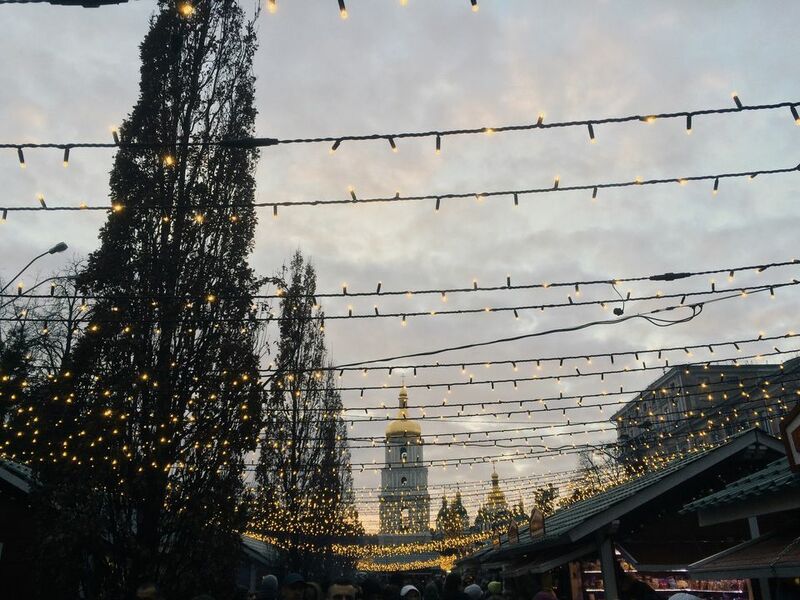 Ukraine celebrates Christmas on Jan. 7th in accordance with the Eastern Orthodox religious calendar, though New Year's Eve has been, because of Soviet culture, the more important holiday in Ukraine. So, for example, the Christmas tree that is decorated on Independence Square in Kiev doubles as a New Year's tree. An increasing number of families celebrate Christmas in Ukraine, both because they want to return to this tradition that was abandoned after the Russian Revolution of 1917 and because they want to establish their own relationship with the holiday. "Sviaty Vechir," or Holy Evening, is the Ukrainian Christmas Eve. A candle in the window welcomes those without families to join in the celebration of this special time, and the Christmas Eve dinner is not served until the first star appears in the sky, signifying the three kings. Families celebrate with holiday dishes made especially for the event. They contain no meat, dairy or animal fat, though fish, such as herring, can be served. Twelve dishes symbolize the 12 apostles. One of the dishes is traditionally kutya, an ancient dish made from wheat, poppy seeds and nuts, and all members of the family share this dish. A place setting might be laid to remember someone who has died. Hay might be brought into the house to remind those gathered of the manger in which Christ was born, and believers might attend church services that night or early Christmas morning. An interesting aspect of Christmas in Ukraine is the bringing of a wheat sheaf into the house as a reminder of ancestors and the long tradition of agriculture in Ukraine. The sheaf is called a " didukh." Those who are familiar with Ukrainian culture understand the importance of grain to Ukraine – even the Ukrainian flag, with its blue and yellow colors, represents golden grain under a blue sky. Caroling is also a part of Ukrainian Christmas traditions. While many carols are Christian in nature, still others contain pagan elements or recall Ukraine's history and legends. Traditional caroling involves a whole cast of characters that includes a person dressed as a shaggy animal and someone to carry the bag that is filled with the rewards collected in return for the songs the band of carolers sings. There might also be someone who carries a pole topped with a star, symbolizing the star of Bethlehem, a Christmas custom that makes its appearance in other countries as well. Ukraine's Santa Claus is called "Did Moroz" (Father Frost) or "Svyatyy Mykolay" (St. Nicholas). Ukraine has a special connection with St. Nicholas, and the figures of St. Nicholas and Did Moroz are closely associated -- when you visit Ukraine, you might notice how many churches are named after this saint associated with gift-giving. Some children might be given gifts on Dec. 19, the Ukrainian St. Nicholas Day, while others must wait until Christmas Eve for holiday present-opening.